However, each of these programs is based on its own engine for demosaicing and processing RAW files, and they are not compatible. Indeed, the rendering of a RAW file in DxO PhotoLab will not be the same as in Lightroom and vice-versa; the same is true for corrections. In concrete terms, if you change, for example, the blue sky in DxO PhotoLab, and then open the same RAW file in Lightroom, you will not see the correction. Similarly, if you apply a black & white conversion in Lightroom, and open the RAW file in DxO PhotoLab, you will not see the image in black and white, but rather in its original colors. DxO PhotoLab: Global and local processing and correction of RAW files. 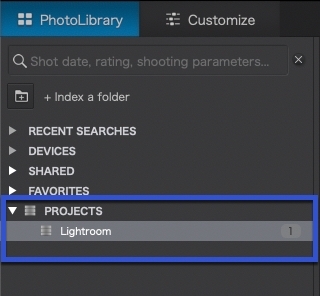 Lightroom: Management of images and metadata (cataloguing). We see here that the two software programs have a distinct approach and role. DxO PhotoLab focuses on image processing, and Lightroom is used for both upstream and downstream operations. This workflow is particularly suitable for photographers who manage their images with Lightroom, but who want to use the image processing qualities of DxO PhotoLab occasionally or permanently, rather than Lightroom’s Development module. 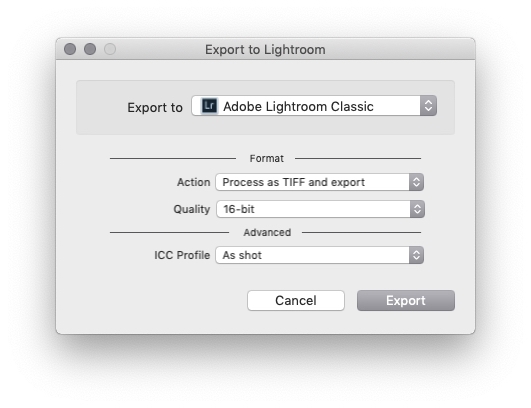 By itself, Lightroom does not allow you to send a RAW file to an external editor, including PhotoShop, so you used to have to create a TIFF, JPEG or PSD file first. However, installing the DxO PhotoLab plug-in allows you to bypass this limitation. Lightroom allows you to import, sort and catalogue your images. You can also edit the metadata — enter keywords, IPTC fields (description of the image content), assign a star rating or a color label. However, making corrections at this stage is not necessary, since they will not be visible when you open the file in DxO PhotoLab. 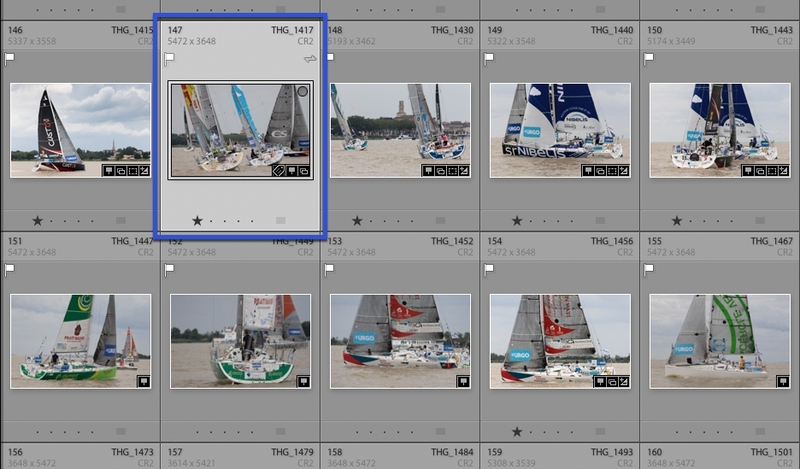 In Lightroom, select one or more RAW files in the Filmstrip or in the Grid to transfer. 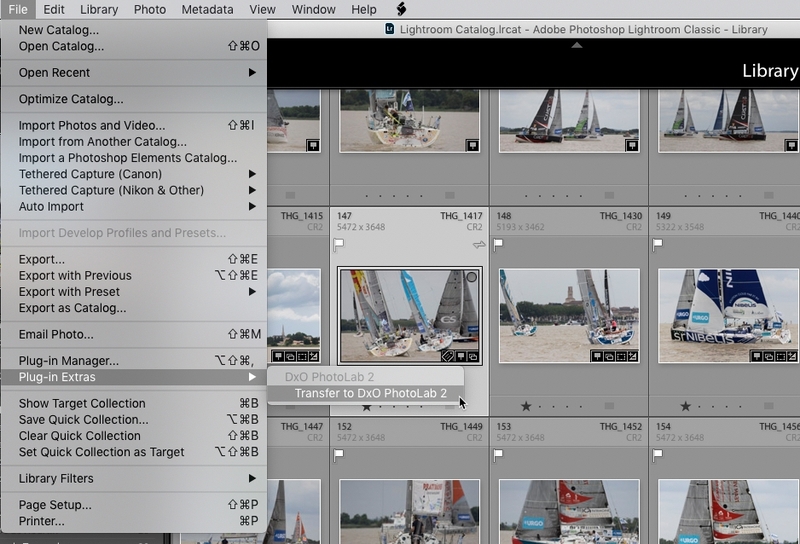 Go to the File menu and select Plug-in Extras > Transfer to DxO PhotoLab. When you transfer a RAW file to DxO PhotoLab, you will not see any Lightroom corrections, but only the basic corrections applied by the default DxO Standard self-adjustment and the DxO optical module associated with the camera-lens combination you used to shoot the image. DxO PhotoLab displays the image in the Customize tab (if you transferred multiple images, the first one is displayed in the viewer, and the others are accessible in the Image Browser). 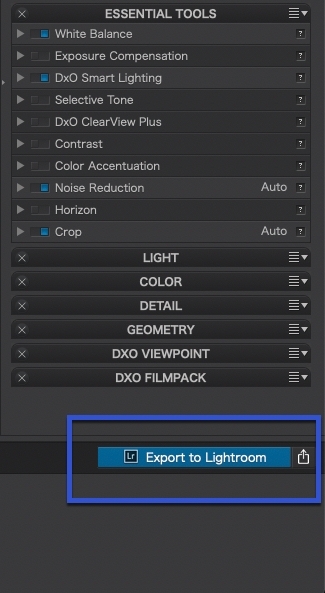 The Export to Lightroom button is automatically displayed at the bottom right in the Image Explorer toolbar. In the PhotoLibrary tab, a project named Lightroom 1 (then Lightroom 2, 3, etc.) is automatically created, containing the transferred image(s). Correct your images in DxO PhotoLab as you usually do, without restrictions, including using local settings or tools in DxO FilmPack and DxO ViewPoint if you have installed them. TIFF: This universally-used format allows you to make additional corrections, particularly in external editors such as Photoshop or the equivalent, while maintaining maximum quality. JPEG: This format offers the advantage of smaller files and universality. You should choose this if you plan to use the image immediately (that is, for sharing, publishing, etc.). DNG: This is the linear, less universal, flow-centric DNG with Adobe solutions that is just as suitable as TIFF for further editing and correction. Export the selected file without processing: Returns the original file to Lightroom, without applying any modifications or corrections made in DxO PhotoLab. Caution: the rendering of linear DNGs in DxO PhotoLab is slightly different from that of TIFF. 1. Select the file or files that you just processed in DxO PhotoLab. 2. 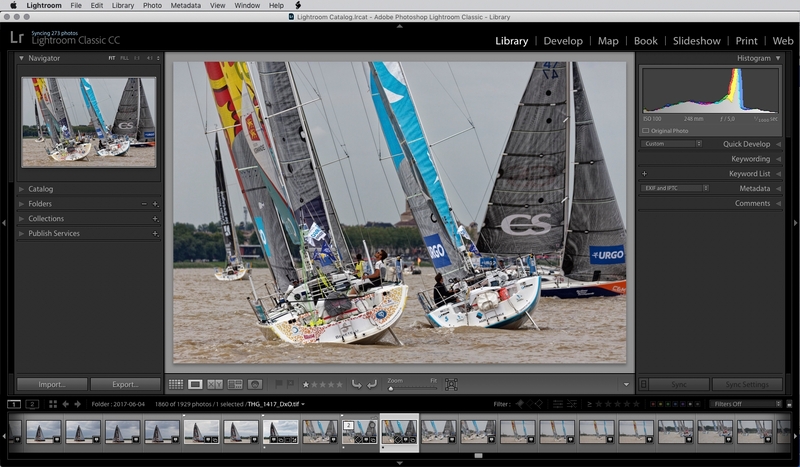 Click on Export to Lightroom on the right side of the toolbar in the Image Browser. 3. In the dialogue box that appears, select the output format as well as any associated options (compression, depth, ICC profile, etc.). In TIFF format, for a coherent flow from the point of view of image appearance, choose the ICC profile “Original,” and for an optimal quality flow, choose 16-bit depth. For JPEG format, if you are considering immediate use — for example, publishing on the web, or for inkjet or lab printing, choose the ICC sRGB profile. Linear DNG format does not offer depth or ICC profile options. Each subsequent time you return one or more files, Lightroom creates a collection within this Set of collections, with the date and time of the transfer as the name. 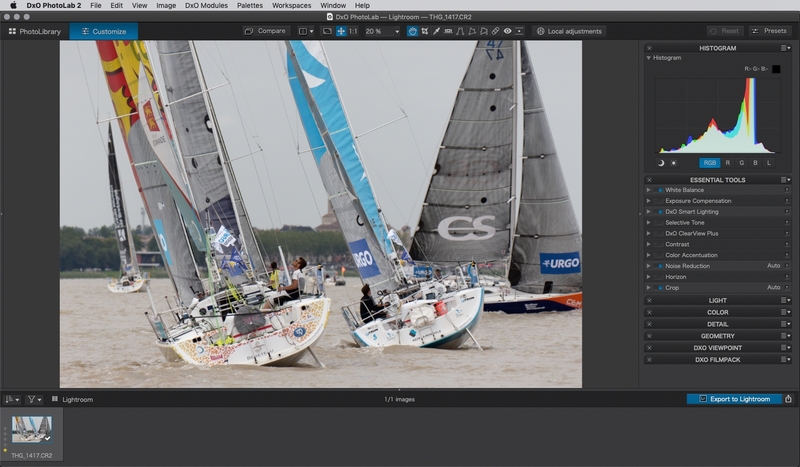 As soon as the image returns to Lightroom, it returns to the foreground, and after a few seconds, it displays the image or images from DxO PhotoLab. Lightroom creates a stack with the original image (to view it, right-click on the image, and then in the context menu, choose Show Library Folder). Note that DxO PhotoLab automatically transfers all the original metadata prepared and edited in Lightroom to the exported files. This metadata includes the star rating, the color label, the information entered in the IPTC fields (for example, Title and Legend), and all keywords. By activating the automatic writing of XMP files in Lightroom (Catalog settings > Metadata). By selecting the files in Lightroom, and saving the metadata there by using the keyboard shortcut Ctrl+S (PC) or Cmd+S (Mac). After exporting to Lightroom, if you need to modify or continue with RAW file corrections that you made in DxO PhotoLab, simply repeat the same transfer and correction process (steps 2 and 3), followed by exporting and returning to Lightroom (steps 4 and 5). 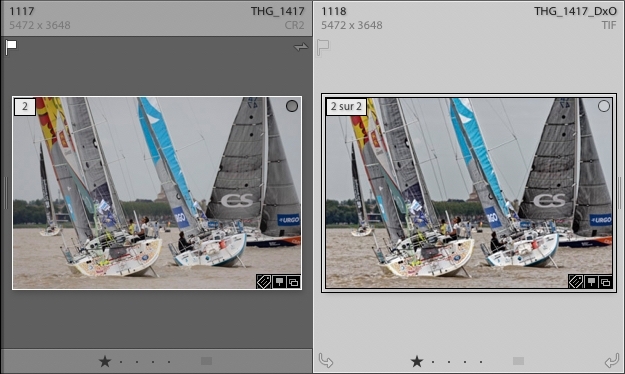 Select the original image in Lightroom. Modify the corrections in DxO PhotoLab as you wish (the corrections you made previously have of course been saved). The dialogue box asks if you want to overwrite the existing file or use a unique name. Select Overwrite to replace the earlier version, or select Use unique names to create a new version that will be stacked with the previous and original versions. The file opens in Lightroom showing the latest modifications you made in DxO PhotoLab.